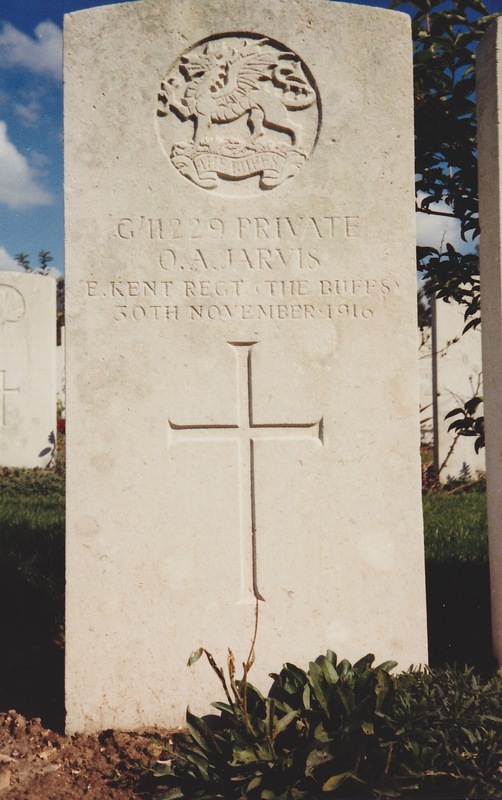 Private Ophir Jarvis was entitled to two medals; the British Victory Medal and the British War Medal. The two medals above are still owned by the family. Ophir Alfred Jarvis was born in Hadleigh in 1880, at which time his father was the Innkeeper at the White Horse Inn on Stone Street. He was brought up in Hadleigh and in 1909 he married local girl Selina Austin and they set up home in Castle Road and went on to have two daughters - Evelyn born in 1912 and Margaret born in 1915. At the age of 35 and with a young family, Ophir answered his country’s call. He enlisted into the Army here in Hadleigh on the 10th December 1915. 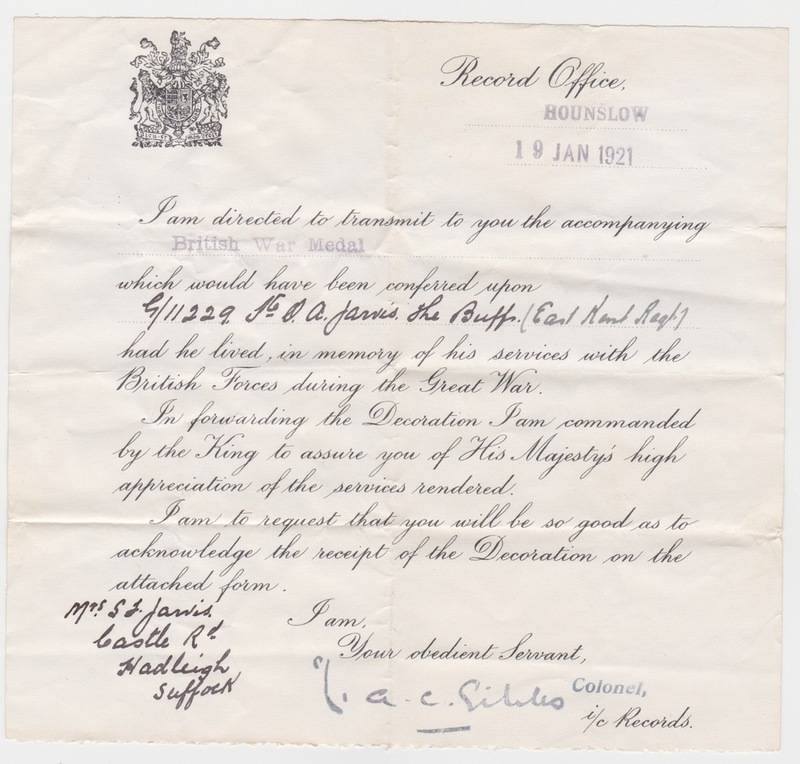 By October of the following year he had completed his training and was sent with around 100 other recruits to join the 7th Battalion East Kent Regiment (The Buffs). The Buffs had earlier suffered heavy losses on the 1st July 1916, during the first day of the Battle of the Somme. The Battle of the Somme continued through the summer months and into November. On the 18th of November, with snow lying on the ground, Ophir’s battalion was ordered to take an enemy trench and went over the top. The Battalion was confident of success and runners going forward with the lead companies were ordered to return to the start line and report when the enemy trench had been captured. However, no runners returned. The only men who managed to return, were the wounded who reported that they had encountered very heavy rifle and machine gun fire. 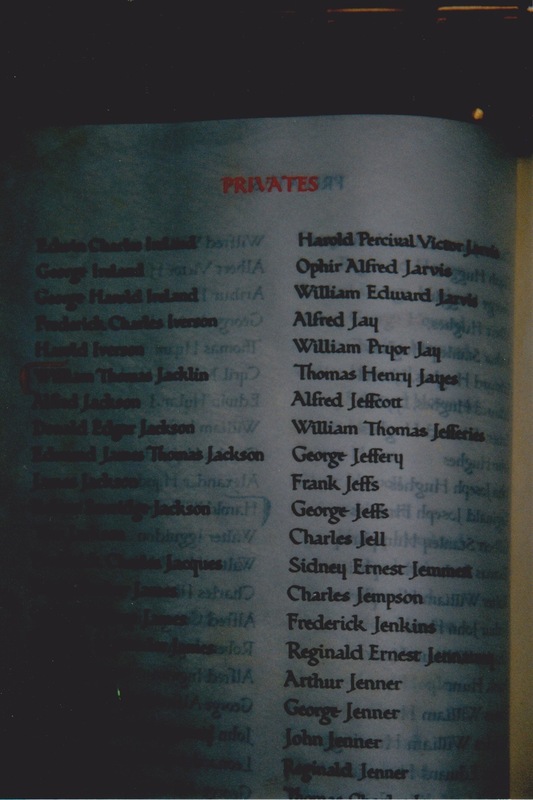 During the 18th/19th November attack, Ophir’s battalion suffered 12 Killed, 120 wounded and 120 missing. Selina, Ophir’s wife received a letter dated 25th November 1916 from Charge Sister J Hardy, informing her that Ophir had been wounded in his right shoulder and both legs, and was a patient in Ward C of the Liverpool Merchants' Mobile Hospital in Etaples. Etaples was the site of a large concentration of reinforcement camps and medical facilities on the French coast and so this suggests that Ophir had been wounded and was being evacuated. The letter goes on to say that it was hoped he would soon be well enough to travel to England where she could see him. However, just over a week later Selina received another letter saying that his condition had suddenly become much worse and that he had died in his sleep on 30th November 1916. Following her husband’s death and in order to supplement her income, Selina obtained employment at a laundry situated in Tower Mill Lane. 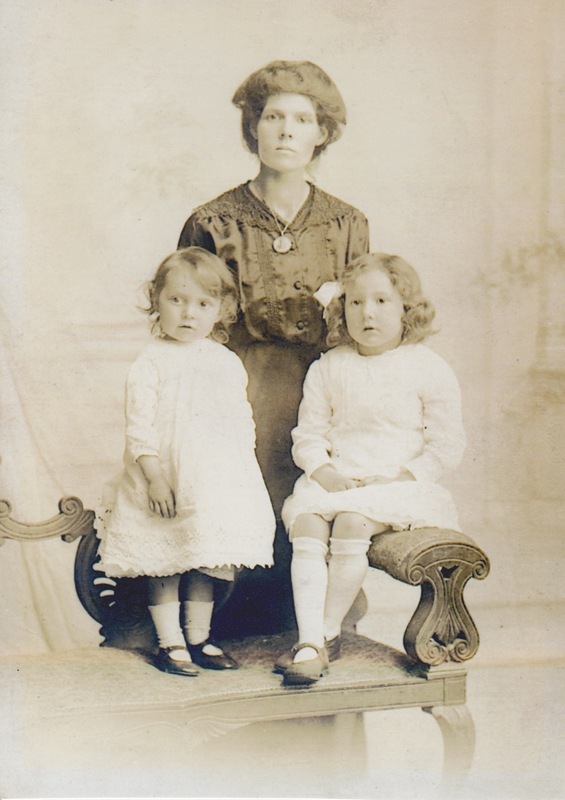 This meant that every morning she had to walk with her two young children from Castle Road to her mother’s home in Cranworth Road, so that her mother could care for the children while she was at work. She then had to walk from Cranworth Road to Tower Mill Lane and having done her days work had to do the journey again in reverse. This, coupled with the fact that she found it a struggle to pay the rent on the house in Castle Road, led to the decision to give up her own home and move in with her parents. This story is typical of the hardships faced by thousands of families all over the country who struggled to rebuild their lives after the war. For most of us, some 100 years later, it can be very difficult to imagine just how hard it was. But there is someone here tonight, who was directly affected. Ophir’s youngest daughter, Margaret is here with us tonight at the grand old age of 99 and remarkably, Margaret is still living in the same house on Cranworth Road. We hope that this page has been able to tell the story of Ophir Alfred Jarvis. If you know of any information which might help to add to the story then please get in touch.